The past few days have been crazy busy for me. After hosting my sister’s bridal shower (along with a few of her bridesmaids) and cooking for 35 women, I needed a few days to recover. Pictures coming soon of the awesome food I banged out, yes..I sure AM a BEAST in the kitchen! Quick and simple dinner tonight, using some left over herb goat cheese and cherry tomatoes I had in the fridge, barely any effort and resulted in some yummy goodness for my tummy. The amount of ingredients is just a suggestion. Like always, I cook to my taste. If the goat cheese is too tangy for you, use less. If you like tons of garlic like I do.. feel free to add more! I use cherry tomatoes because I always have them on hand, plus I like their sweetness. You can substitute with regular tomatoes, just quarter (or 8th if it’s a big tomato) them. 1. Follow directions on the box, cook until al dente. 1. In a large pot on medium high heat, add the olive oil and garlic. Saute until lightly brown, don’t over cook as garlic will become bitter. 2. Add Cherry Tomatoes (save a handful or 2 for the end) to the oil and garlic, let it cook until they’re soft and begin to “pop”, use the back of your spoon to squish them against the sides of the pot. Add your thyme, red pepper flakes, salt and pepper to taste. If your tomatoes are acidic, add the sugar to counter it, but if they’re naturally sweet, then omit it. (Basically taste the sauce to gauge if you need it or not) Let stew over medium heat for 15 minutes. 3. 5 mins before adding pasta, throw in your handfuls of fresh tomatoes. 4. Add pasta and toss to coat, add goat cheese (crumbling it between your fingers into the pot), toss to allow goat cheese to melt and add a creamy texture to the pasta. Add peas and toss for another 2 minutes to let them come to temperature. 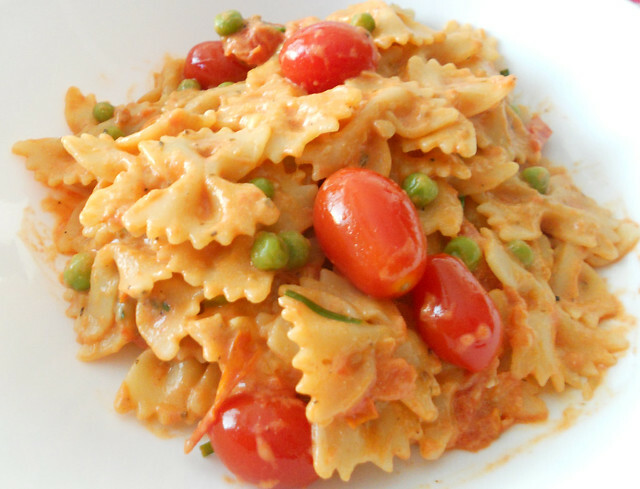 If pasta seems too dry, add a ladle full of pasta water at a time until you have a moist creamy consistency. Check for seasoning, adding salt or pepper as needed. Add Parmesan cheese and chives lastly. 5. Serve with an extra sprinkling of Parmesan cheese on top and email Ms Fatty to let her know how easy it was and you love the tangy, creamy pasta! Sounds yummy. I can’t wait to try this one and I’ll have it all to myself because no one else here will eat fresh tomatoes! @ Kai.. I hope it works out for you! @ Ros.. yayyy! my pics are getting better aye? This looks too good NOT to have shared on my fb page, BL YUMMMMERS!